Discover the secret to a life filled with abundance and good fortune. The four cosmic sessions in the Law of Attraction Subliminal Messages Bundle will help you tap into the limitless supplies of universal energy all around you. Become the master of your own destiny and unlock the power to make all of your dreams come true. Attract anything you want into your life! Learn how to switch on your natural money-making instincts and become a magnet for unlimited wealth and riches. Draw more money your way! Be grateful for the things you’ve got so you can spend your time enjoying everything that life has to offer. Manifest your ideal lifestyle by learning how to open up and letting abundance find its way into your heart and mind. Attract more abundance your way! 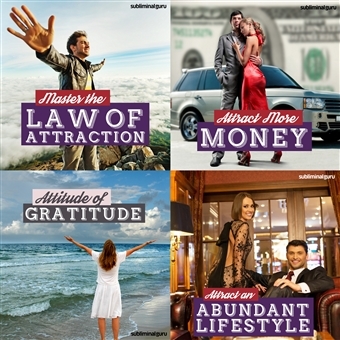 Download the Law of Attraction Subliminal Messages Bundle now to enjoy a life of plenty and a future filled with abundance and prosperity. Make the Universe Work for You, with Subliminal Messages!